David Waldman was the first member of his family born in the U.S. and the first to go to college. 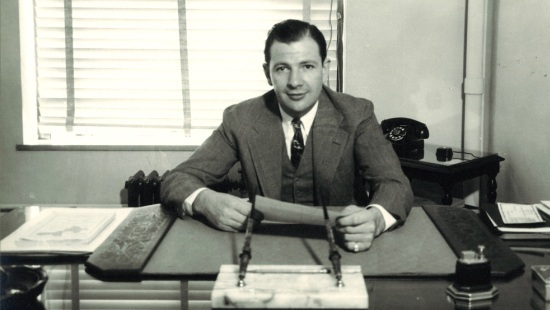 Born in 1909, he began working at age five, selling newspapers and shining shoes on the streets of downtown Kansas City to help support his family. He never forgot where he came from, or the platform that launched his successful career as an attorney: the Kansas City School of Law (now the University of Missouri-Kansas City School of Law). His perseverance, and his dedication to UMKC, runs through three generations of devoted Kangaroos, and this year the Waldman family is being honored with the UMKC 2014 Legacy Alumni Award. David Waldman graduated from the law school in 1932. He was determined to finish early, enrolling in fulltime day and evening classes the same semester. He walked from his West Bottoms home to the School of Law to save his nickels to buy food for his family. His efforts paid off when he graduated early and with honors in the top five percent of his class. His children followed in those intrepid footsteps. “Around the Waldman household, where else would you study?” asked Steve D. Waldman, David’s son, who earned two degrees from UMKC: a bachelor’s and a medical degree. “My father often spoke about the opportunity that his education at the Kansas City School of Law had given him. Against all odds, he attended school during the Depression. He walked from Kansas City, Kan., to the School of Law, which was then located in downtown Kansas City, each day, painting box cars for the railroad to pay his tuition. Steve Waldman (B.S. ’73, M.D. ’77) and his brother Howard Waldman (B.A., B.S. ’75) both graduated from the UMKC College of Arts & Sciences with degrees in geosciences before pursuing careers in medicine. They – along with other family members – have continued to serve their community and their alma mater in the fine tradition of their patriarch, David Waldman, who died in 2009 at the age of 99. Throughout his career as a trial lawyer, David Waldman mentored and provided financial assistance to countless students who attended the UMKC School of Law, including his brother-in-law Leonard Swade (B.A. ’53, J.D. ’56) and his nephew James Scherzer (J.D. ’80). Supporting their university is a family tradition that continues among the Waldman clan today. Swade said David Waldman’s help was essential to his success at UMKC. Steve Waldman completed his residency in anesthesiology and serves on the clinical faculty of the UMKC School of Medicine. One of the first pain management specialists in the region, Steve founded pain clinics at numerous Kansas City area hospitals. Steve and his wife, Kathy, have raised four children: David attended the College of Arts & Sciences and Corey (B.L.A. ’11, M.D. ’12) graduated from the UMKC School of Medicine in 2012. Jennifer attended the School of Medicine and Reid is a current student at the School of Medicine. Kathy’s sister, Margaret Peggy Keith (B.B.A. ’94), once served as the COO for her brother-in-law’s pain clinics, and is currently co-owner of the Lenexa-based graphics company, Custom Color Corp.
That tradition is important not only to the family, but to the community, Steve Waldman said. The Legacy family is chosen for professional achievements, community service and a tradition of attending and supporting UMKC. The Waldman’s award, and those of the other alumni honorees, one from each school and the five university-wide awards of distinction, will be presented by the UMKC Alumni Association at its 2014 Alumni Awards luncheon on April 24.